You may know about Dr. Mae Jemison’s work as an astronaut for NASA, but do you know the entire story? Check out these fun facts to find out a little bit more about Dr. Jemison’s lifetime of accomplishments. FORMER YEARS – Dr. Jemison graduated from high school at 16 and attended Stanford University, graduating in 1977 with a degree in chemical engineering (and fulfilled the requirements for a B.A. in African and Afro-American Studies). She then went on to earn a doctorate degree in medicine from Cornell University in 1981. She worked as a general practitioner in Los Angeles for several years. TAKING FLIGHT – After returning from her service in the Peace Corps and watching Sally Ride’s historic flight as the first American woman in space, Dr. Jemison applied to NASA’s astronaut program. In 1987, she was one o f 15 people selected for the program. STAR TREK – A bonafide Trekkie, Dr. Jemison’s love of Star Trek—and the African American female character Lieutenant Uhura—inspired her to want to go to space. In 1993, she was excited to get a speaking role in the Second Changes episode of Star Trek: The Next Generation. SPACE TRAVEL AND BEYOND – Dr. Jemison is the principal of the 100 Year Starship Project, which has set a goal to ensure we have the capability for human travel beyond our solar system to another star in the next 100 years. 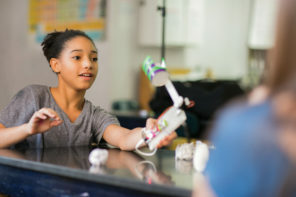 BAYER: MAKING SCIENCE MAKE SENSE® – She is the chief ambassador for Bayer’s Making Science Make Sense® initiative, which began in 1995. 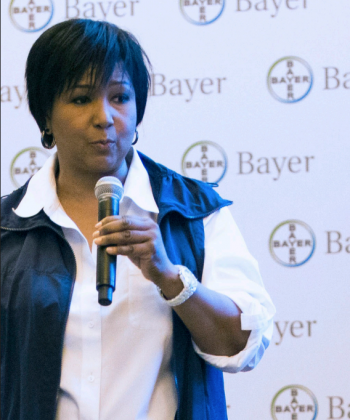 For over 20 years, Dr. Jemison has been traveling the country on behalf of Bayer, talking to elected officials, education and industry leaders, parents, teachers and students about STEM education, science literacy and diversity issues. Read our full interview with Dr. Jemison to learn more.